As part of my Point Pelee road trip this summer, we visited Pelee Island for a day trip. We stayed in Leamington, a town nearby and the “Tomato Capital of Canada”, for a few nights. For us, Leamington was the gateway into Point Pelee National Park and Pelee Island. Both places were the highlights of our road trip and from Leamington, it took about twenty minutes by car to get to the park or ferry dock. Since we wanted to spend as much time as we could on Pelee Island, we arrived about one hour early to buy the 10am ferry ride, the first ride of the day at Kingsville Ferry Dock. Passengers are only allowed to buy one way ticket to and from the island. We liked the flexibility of this ticketing system. The cost of a one way ticket is $7.50. The duration of the ferry ride to Pelee Island is approximately 1 hour and 30 minutes. Once we arrived at the island, we immediately walked over to Comfortech, the only bicycle rental store on the island. Comfortech is about a few minutes walk from the ferry dock. We rented our bikes all day for $25. After studying the map of the island, we decided to bike around the whole island via the Waterfront Trail at our own pace since we had until 7pm to return our bikes. The bike route was approximately 30.3 km and the map estimated that it would take us anywhere between 2.5-4 hours to complete it, not including time spent at each point of interest. The weather on that day was warm, sunny and breezy: perfect for biking all day! We found one day on Pelee Island too short of a time. Next time, we would like to stay overnight or a few days at one of the cozy inns so we can explore the island at our leisure. If you enjoy a slow pace of life, and being surrounded by the beauty of nature and friendly locals, then Pelee Island may be your kind of paradise. All in all, Pelee Island is definitely Canada’s best kept secret! After some very last minute and late night..ummm..early morning packing, I’m super super excited that I’ll be heading to the airport soon to fly to South Korea for the rest of the summer!! I’m going on a teach abroad cultural exchange summer assignment with 10 fellow Canadian colleagues to teach English to students and to train teachers there as well. Afterwards, I’ll be travelling within Korea with my Korean friends and sometimes on my own. I think it’ll be an adventure of a lifetime! When I return, as promised, I’ll post my last 2 favourite places I found while travelling in Vancouver 2 weeks ago on my blog. Stay tuned for that! Have a relaxing, fun and fabulous summer & talk to you all sometime soon here!!! Special Note: You can also simply drizzle the salad with olive oil, instead of tossing it in raw apple cider vinegar. Wash, drain and dry spring mix, blueberries and raspberries. 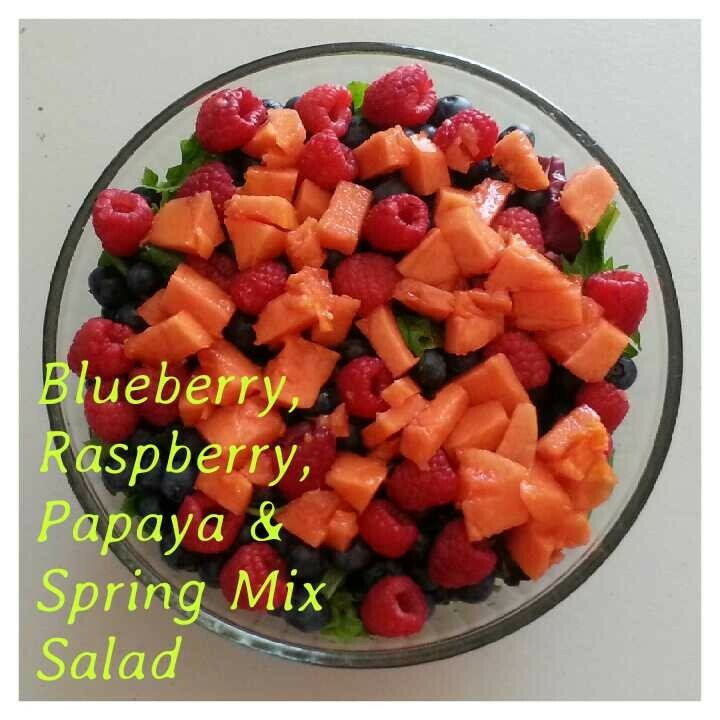 Toss spring mix, blueberries, raspberries and papaya in a salad bowl with the apple cider vinegar.